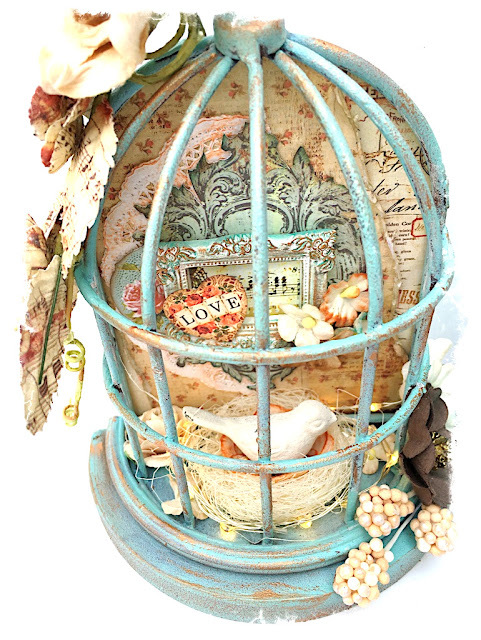 As soon as I saw these Prima birdcages, I had to have them! I decided to make them a coordinating set to put on a shelf. I used mostly all Prima products, including the Vintage Emporium collection. I knew I wanted them to both be blue. The larger one comes with a white distressed finish, and the smaller one is rust, so I primed them with gesso, then used the Prima light patina paint. After it dried, I dry brushed them with some bronze paint (also Prima) to get this finish. For both of the cages, I covered the back inside with papers from the Vintage Emporium line, then added some layers. I used sisal to create the bird nests, and placed a flower inside before gluing the birds in, and then wrapped the Lumies light strings. The switches are on the outside of the cages and sit somewhat behind but on the side, but are concealed by the flowers in the middle of the two cages so that I can turn them on and off with ease. I colored the resin pieces with chalk ink and bronze paint. The larger cage has the Prima playing cards to spell out the word "dream."